Growing number of players are capitalizing on avenues emerging due to the integration of home energy management systems (HEMS) with smart grid technologies. 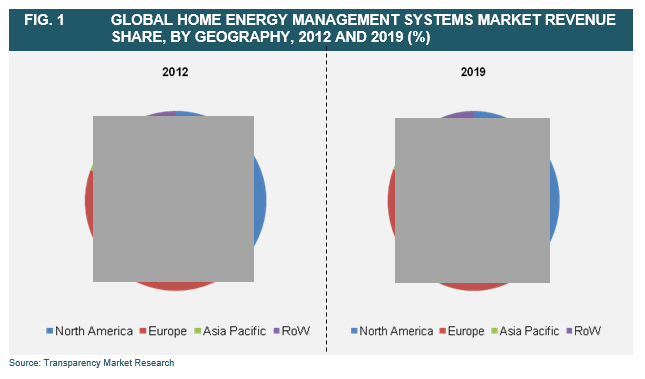 Several companies in the global home energy management systems market are tapping into substantial revenue streams to bolster their positions, finds Transparency Market Research (TMR). Developed markets also offer incumbent and new entrants vast lucrative avenues, and are supported by favorable carbon tax policies. A large number of prominent companies in the global home energy management systems market are domiciled in the U.S. The information presented in this review is based on a TMR report, titled “Home Energy Management Systems Market (Functionalities - Control Devices, User Interface, and Enabling Technologies; Technology - Wi-Fi, ZigBee, HomePlug, Z-Wave, Insteon, Wavenis, Enocean, and Ethernet) - Global Industry Analysis, Size, Share, Growth, Trends and Forecast, 2013–2019”.